In a city that has dramatic landscapes, vibrant markets and rich culture coming at you from all angles, the only place you want to be is right in the center. Encircled by jaw-dropping scenery, Inn at the Market has the views you want to open your curtains to, with the calming waterfront of the Puget Sound on one side, the towering majesty of the Olympic Mountains on the other, and the scene of Pike Place market buzzing busily around the hotel. In the mix of Seattle’s bustling downtown, you can’t get closer to the buzz than at Inn at the Market. Located within Pike Place market, the hotel offers luxury repose from the hive of surrounding activity, filling you with tranquil vibes as soon as you take those first steps into the hotel’s ivy-covered courtyard. Start exploring the downtown Seattle sights of the Space Needle and Olympic Sculpture Gardens, and even catch the ferry to visit the quaint country escape of Bainbridge Island. Not forgetting you’re right in the middle of all the vibrant goings on at Pike Place market, the city’s top notch eateries, bars and coffee culture are also right on your doorstep. The classic Northwestern style, Inn at the Market offers elegance and comfort, with its 70 rooms specially designed and furnished to provide the most relaxing and stylish stay. Sink into glorious king size Hypnos beds, chilling to the tunes from the iPod dock and enjoying the views from the floor-to-ceiling windows over Seattle’s waterfront, mountains, or urban skyline. Inn at the Market’s extra touches also let you know you’re in the lap of luxury, like the plush signature bathrobes and the gourmet selection of Seattle’s best coffee laid out and ready to enjoy (this is Seattle after all). It doesn’t stop there though; Inn at the Market’s in-house restaurant, Café Campagne will excite your taste buds with Parisian finesse, transporting you to French café culture with its rustic bohemian vibe and authentic French cuisine on the menu (snails and all). Acclaimed by Seattle’s top critics for some time now, you’ll be spoilt for stylish choice at Café Campagne. With everything we want in a hotel; style, luxury, great location and exquisite food, it is easy to love Inn at the Market. 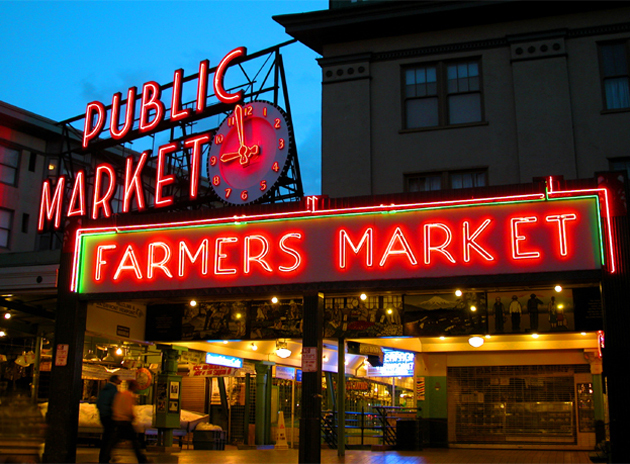 We love how close the hotel brings you to the beating heart of Seattle’s scene in Pike Place market, putting the city’s best fresh food, cafés, and restaurants right outside your door – and without ever letting the bustle of the market into the tranquil surrounds of the hotel. Inn at the Market maintains this tranquillity with flooding its rooms with the astonishing views; the quiet shimmer of the waterfront on one side, and the dramatic beauty of the Olympic Mountains on the other. 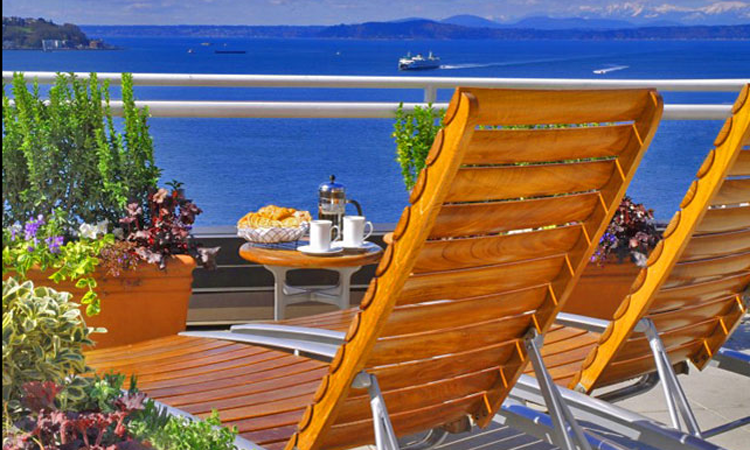 We love the rooftop deck, where you can unwind with specially selected cheeses and local wines, taking in some of the best views of downtown Seattle and the waterfront at Elliot Bay.